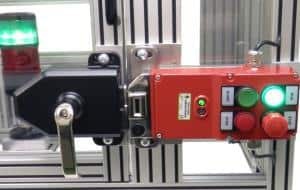 IDEM Safety Switches: UGB-KLT Series Universal Gate Boxes Incorporating Safety Interlocking - Allied Automation, Inc.
IDEM Universal Gate Boxes (UGB-KLT) provide high level RFID coded interlocking and machine control functions in one heavy duty housing. They can be easily fitted to access doors to provide guard locking, rear escape options and sliding or rotary handles. They reduce the risk of operators being trapped inside a guarded area. The UGB-KLT housings will incorporate standard 22mm push buttons, lamps or switches which can be added to provide machine request or control functions all from one UGB-KLT housing. Available as 4-Station Model or 2-Station Model. The end user chooses buttons, switches, lamp options for each station. Robust Safety Interlock switches with RFID and multifunction control features built into one housing. 2 or 4 station housing for incorporating wide choice of standard 22mm push buttons, lamps or switches. Optional sliding handle actuators or rotary handle actuators. Rotary one way rear escape handle (cannot be re-closed from inside the hazardous area). The built-in KLT switch has both anti-tamper RFID coding technology and standard mechanical interlock technology. 24Vdc solenoid to release lock. Built-in LED diagnostics of switch status and easy to read label legends. Available in Stainless Steel 316 with mirror polished finish or die cast metal painted red. Holds guards closed and locked up to 3000N. Can be padlocked off for safe working.